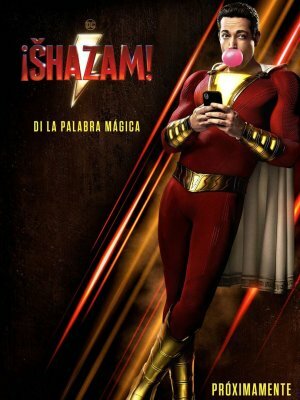 Zachary Levi (Shazam), Djimon Hounsou (The Wizard), Mark Strong (Dr. Thaddeus Sivana), Michelle Borth, Meagan Good (Darla Dudley (Adulta)), Jack Dylan Grazer (Freddy Freeman), Adam Brody, Marta Milans (Rosa Vasquez), Lovina Yavari (Store Clerk), Asher Angel (Billy Batson), Grace Fulton (Mary Bromfield). David F. Sandberg (Dirección), Michel Aller (Montaje), Maxime Alexandre (Fotografía), Henry Gayden, Darren Lemke, Bill Parker, C.C. Beck (Guión), Benjamin Wallfisch (Música), Peter Safran (Producción).